The Washington Trail is located throughout Washington Parish, the northeast corner of our five parish region. Drive through the quaint cities of Franklinton and Bogalusa as well as the rolling countryside. The images honor the people of Washington Parish and those who settled the Florida Parishes: Medicine Shield (Native Americans), Thistle Flower (Scots), Cape Primrose (African Americans) and the Shamrock (Irish). The border is a Celtic chain, and the center’s pink rose is a symbol for the club itself. Images derived from the fact that the majority of the Winbury Club members have been school teachers or have been involved in the field of education. A quilt displayed in Franklinton Town Hall honors the veterans of the community and has been signed by many of them. 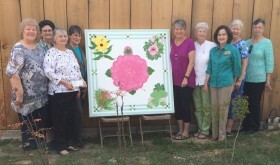 Created by local quilters, this quilt was the inspiration for the pattern of this painted block. Jerry has always been fascinated with pelicans so the official state bird, accompanied by a magnolia, seemed the logical choice for her quilt square. This quilt block is Jerry’s first painting in all of her 91 years. Painters: Sharon Klerk, Dudley Magee and Joan Simmons. The Homemakers created this design because of their location near the Bogue Chitto River, nestled in the piney woods. The club is involved in continuing education, family values, homemaking skills and the church. Immigrants who settled in Bogalusa in 1905 carried on their Sicilian tradition of honoring St. Joseph: 12 fish for 12 apostles, braided bread, candles, lucky fava beans, wine, pignolattis. Magnolia Leaves hung on the fence outside of an altar to welcome. Floor and pine branch represent the early sawmill that employed the immigrants. Bogalusa was a “company town.” Great Southern Lumber Co. harvested the long leaf pine and built the city. This quilt design includes examples of the four types of company houses that were built for the workers. The circle of life includes the four directions giving growth, inspiration, health, wind and rain. The rays represent happiness, growth and the power of man as he lives in harmony with nature. The hand represents man himself. Images represent the parish's offerings: birding, hunting, fishing, biking, tall pine trees, forestry, farming, patriotism, Mile Branch Settlement and Museums of Cassidy Park, dairy, watermelons and blueberries. The border symbolizes the multiple Trails in the parish. Very fitting for a fabric shop to have a spool of thread pattern for its quilt block. The spool of thread goes hand-in-hand with a yard of fabric. One cannot quilt without a yard of fabric. UNFORTUNATELY, the shop, Jackie's Fabrics, burned to the ground including their quilt block. Jackie, with her ever-persevering nature, is determined to rebuild the shop and reconstruct her block. You can write to her at the address above. This building on the fairgrounds is the showplace for parish homemakers to showcase their quilting, sewing and canning talent during the Washington Parish Fair in October. The pioneer settlement was established in the fairgrounds in 1976 as a tribute to the pioneering spirit of Washington Parish residents. Each house in the settlement is a log cabin. This block is the quilt pattern for Louisiana which also contains images of watermelons, an important crop for Washington Parish. This block is a pattern of a quilt in the museum’s collection that is over 100 years old. The quilt itself, donated by Maudine S. Knight, is on view inside the museum. The Varnado Store Museum was established in 1996.